The quince is an intriguing fruit. Looking like a cross between large apple and a pear, it is inedible when raw and turns from pale yellow to a rich amber colour when cooked. I’d never tried one before, so when I spotted a handful in the local greengrocers, I knew an experiment had to commence. 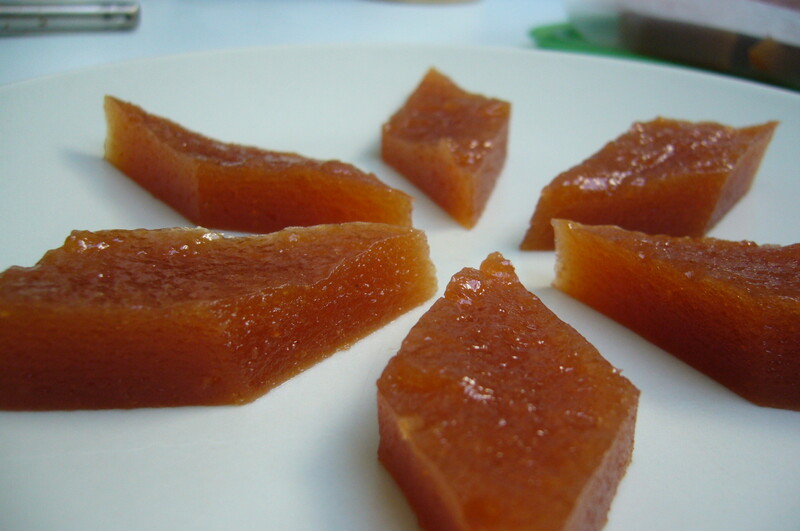 I decided to make quince “cheese”, which is not a cheese at all, but more like a set preserve. This works well with quince due to its high pectin content. It’s wonderfully fragrant, tasting a bit like a pear, a bit like a guava, but totally unique. This recipe was adapted from Preserves by Catherine Atkinson and Maggie Mayhew. Wash and chop the quince, and place in a large pan, seeds, skin and all (to extract maximum pectin, aiding the gelling process). Pour in enough water to nearly cover the fruit and put a lid on the pan. Bring up to boiling point and simmer for around two hours, or until the fruit has turned very tender and orangey-red. Stir every once in a while. Strain the mixture through a fine sieve into a bowl, extracting as much juicy pulp as you can. Pour the purée back into the pan, adding the sugar. Stir over a gentle heat until the sugar has dissolved. Turn the heat up a little and cook for 30 – 40 minutes, stirring constantly until the mixture is very thick. Pour the quince purée into a small oiled tin or dish and leave to set for a few hours. Cut into pretty shapes, such as diamonds (you could even use small cookie cutters), and store in an airtight container between layers of baking paper. They make great little nibbles.